From the heartland of Australia’s leisure and pampering universe on the Gold Coast, Annabel Trends is a family run company that’s cornered the market on fresh, fashionable items for the home including some seriously cute toys. Bunnies have hippity hopped into our hearts thanks to Peter Rabbit and all his friends along with countless nursery rhymes and songs. Now little ones can fall in love with Oliver Bunny - the bunny about town. 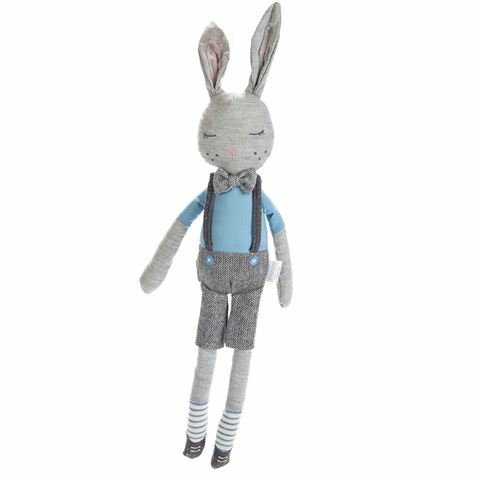 In his tweedy pants with braces, with a matching bow tie, blue top, striped socks and grey shoes, Oliver Bunny would look at home in the CBD. He is quite simply a dapper bunny and would set the right note in any pram or stroller. Annabel Trends Bunny Collection – no child should be without one. Crafted from 80% polyester and 20% cotton with a 100% polyester fill. Dressed in tweedy pants, a bow tie and socks with soft shoes. Soft toy perfect for prams, strollers. Makes a lovely toy for the cot.